Greetings, Shredderz! As we ease into the weekend I thought I’d share some videos I’ve been enjoying lately. Well, you can’t watch the video above embedded in this blog, but it’s worth checking out on Vimeo. The Encyclopedia of Surfing has published the entirety of “Waterborn”, a 1987 surf movie from Gotcha, on their Vimeo page. Gotcha’s surf team was the stuff of legends — Pottz, Gerlach, Cheyne Horan, Brock Little, Derek Ho, I can keep going — and this is a cool video. It has some great footage of Pottz surfing some of his classic signature boards, including his Glenn Minami twin fin as well as some colorful T&C sticks, like the one pictured above. More importantly, “Waterborn” was directed by Bill Delaney, who sadly passed away recently. Delaney directed the seminal Seventies surf movie “Free Ride”, and he will surely be missed. Tristan Mausse AKA Fantastic Acid is one of my favorite follows on Instagram. Monsieur Mausse has also published a couple of cool books on surfboards, “Glass Shops” and “Surfboard Dynamics”, which you can find on his site. In this video Mausse and fellow shaper Jean Penninck of Naje Surfboards test some hand-shaped hulls in some fun and relaxed European winter surf. Apropos of nothing, I have been enjoying South African Mikey February’s surfing lately. Most of the surfing in the clip is done on standard thrusters, but he’s just got great style. Oh man, this board is killer. Michael Tomson, cousin of Shaun, founded Gotcha clothing. Stussy even designed an early Gotcha typeface that was used prominently during the 80s. This thruster has all the little touches I love about Stussy’s boards, including some nifty hand-drawn graphics. I love the little planer design, and the Gotcha shark logo on the deck is an awesome throwback to the brand’s heyday. Make sure you hit the link above for a shot of the sick Stussy Team logos on the fins. I also wrote up this board when it popped up at the Vintage Surfboard Collectors Club swap meet a few months back. I can’t think of a better representation of Echo Beach than this incredible board. The board was shaped in 1980, and the auction estimate is between $2,500 and $3,000. There are so many details to love about this board, whether it’s the branded glass-on fins, the huge Lance Collins laminates, or, of course, the inimitable airbrush. The board has been restored, which I find slightly odd given the visible ding on the bottom right above the fins, but I’m not going to quibble. This Wave Tools twinny is ridiculous in all the right ways. My initial guess was that this stunner was shaped in the 1980s, but it turns out it’s from 1978. Then again, it feels a little silly to focus so much on dates given the timeless — and bitchin’ — checkerboard graphic on the deck. This T&C single fin has also been restored. And while I prefer my boards all-original, this is a stunning example of a classic Hawaiian single fin. Alright, this technically isn’t an 80s board, either, but given how sweet the board is, I am willing to make an exception. Like the other Glenn Minami example above, the board has been restored, hence its impeccable condition. I can’t get enough of the color scheme, and I really dig the old school Town & Country logos on both boards. I think it’s interesting how Glenn Minami’s name appears in a sans serif font on the sting, and then in a script font on the checkerboard single fin above. The sting is also dated to 1978. If you haven’t already, make sure you check out the website for more boards that are being listed for auction at this year’s Boardroom Show. I’d also encourage you to attend, if possible! (Sadly, I won’t be there, due to existing commitments). If classic boards are more your thing, there is an embarrassment of Renny Yater riches up for auction this year, including a mini-gun with stunning abalone inlays, and a 1963 Pat Curren model elephant gun. There’s also a Phil Edwards Honolulu Model, an unrestored Gordon & Smith Skip Frye v bottom, a Bing David Nuuhiwa Lightweight with a tiger stripe paint job, and finally, an incredible Rainbow Surfboards example with a next level airbrush. Make sure you check out the site and support the fine folks who make this celebration of vintage sticks possible. Greetings, Shredderz! If you’re currently wondering whether or not this humble little vintage surfboard blog took a sudden left turn, let me assure you that is not the case. Shred Sledz remains as dedicated as ever to our mission of shedding light on the great surfboards and craftsmen of yesteryear. 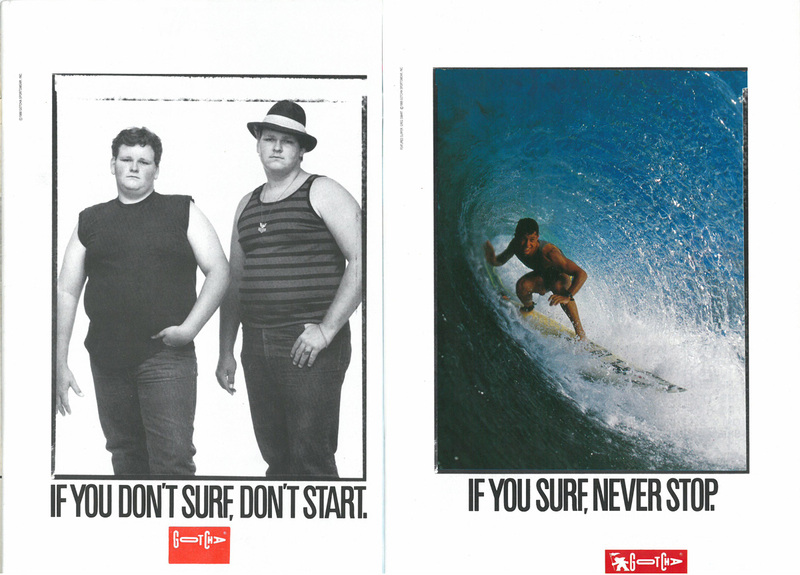 But let’s face it: this 1980s Gotcha ad is simply too funny not to post. Throw in a pair of acid wash jeans and the ad hits every single cliche about bad fashion in the 1980s. More importantly…what on earth is going on? Is the painting on the left supposed to be coming to life? Why is the other guy just staring off in the distance? Sadly, seeing as how this is a family friendly blog, I think there are many questions that will have to go unanswered. And if you haven’t noticed, that’s Pottz who’s getting his tank top stretched out. Not sure how they coerced him into doing this photo shoot. I imagine the ad was originally intended to be edgy and provocative, but with three decades worth of perspective behind us, the entire thing is silly. I say that affectionately, though: no matter what, I will always have a soft spot for the weird and colorful creations that the surf industry produced during the eighties. Fun fact: the Gotcha logo that appears in the ad was actually designed by Shawn Stussy. As always, tune in next Thursday for the next installment of Sagas of Shred!